Did you know that George Mortimer Kelson, author of The Salmon Fly, habitually fished in a bowler hat around which he wound his casts or that Ephemera (Edward Fitzgibbon) caused such a furore by tying a salmon fly with a woman’s pubic hair that he was forced to flee the country? Such fascinating facts and many more are to be found in this latest tome from the pen of Andrew Herd. 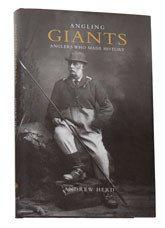 Herd’s original concept was to produce a book of short biographies of eighty famous people who were anglers. The past tense ‘were’ being the operative word since the author wished to avoid the embarrassment of having to reply to letters from people who thought that they were more famous than he did. Who to include and who to leave out proved a difficult choice and no doubt some anglers will feel aggrieved that their favourite author or angling hero has been omitted. In its final form the book consists of one hundred and three short biographies of famous anglers and authors arranged in alphabetical order from Frederick Aflalo to Lee Wulff, together with a very useful bibliography. Herd has included the biographies of a number of American anglers such as Theodore Gordon, the father of American fly-fishing, Ray Bergman, Edward Ringwood Hewitt and several others, which will no doubt add to the book’s appeal over the Pond. British anglers represented range from Dame Juliana Berners to Barrie Rickards, who sadly died just a few months ago. It must be admitted, however, that the author’s choice is a little idiosyncratic and includes such characters as Cleopatra, the Norse god Thor and Hiawatha. The author himself admits that this is not a book to read from cover to cover in one go and he recommends that the most logical approach would be to read one of the lives and then the books that went with it. However, in the few days since receiving the book I found myself continually dipping into it and being fascinated by the diverse lives to be found within its covers. The book is beautifully produced and remarkable value at £20. Herd is to be congratulated for producing such a useful volume and it is an absolute must buy for anyone interested in the history and literature of angling.